I had read Uncle Tom's Cabin in high school. Last year I began re-reading it but this one was side-tracked for reasons which I cannot remember. I was glad when Barbara chose it for the Reading to Know book club as it would give me the opportunity to re-read it in it's entirety this year. I'm very grateful that I have. 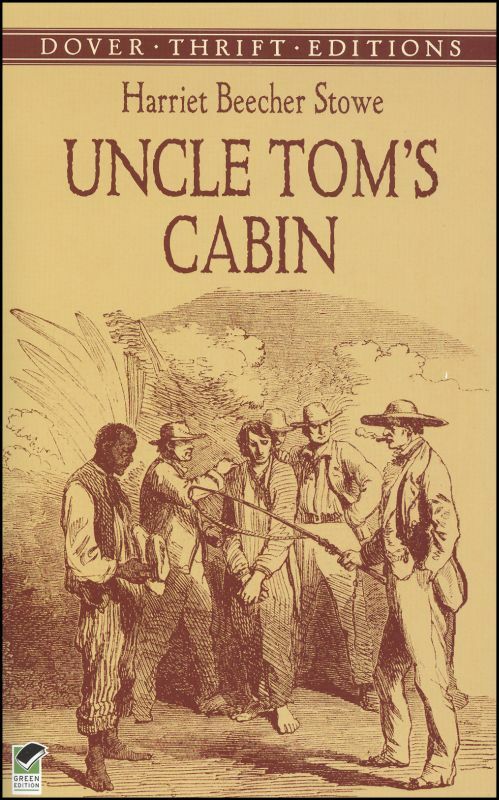 For purposes of sharing/retaining my thoughts on Uncle Tom's Cabin I'll mention what stood out most to me. That was? The extremes in the personalities of the individual characters - which allowed me to see myself all throughout this read. Because of Stowe's straight forward manner of presentation . . . I saw myself in George. I note injustices and am riled by them (easily). My reaction is not always the best and this is something I've had to work on. To be sure, he suffered a grave injustice and I find his reaction perfectly justifiable. I saw myself in Eliza. Very much so. When you are a mother and someone threatens your child in any way, shape, or form, you'll flee from the danger as fast as you know how and protect your child and your family at all costs. I wish I could say that I saw more of myself in Tom. It is very hard for me to be patient under affliction. It is very hard for me to trust that everything is working out for my ultimate good. Tom mentions more than a few times that he is putting his trust in the Lord and intends to hold tight. I repeat to myself constantly that I must trust. But my periods of trusting are interspersed with periods where I'm freaking out. I am one of those complicated works in progress I mentioned earlier. I saw myself in St. Clair. It's so easy to drift into periods of relaxation where we find it easier to do nothing to fix a bad situation than to do something. Yes, we can recognize atrocities all around us, but we as one lone individual feel powerless to stop it and so we slip into apathy at a great cost. We fool ourselves into thinking that we cannot bring about change and only too late discover that if we had obeyed God and conscience, we could have made all the difference. Mostly, I saw myself in "Vermont" or Miss Ophelia. I'm good with going half-way into a commitment but being afraid to follow through to the end, no matter how great or how bitter the end might be. I have great thoughts and convictions about what is right and what is wrong, but I don't always back up my words with actions. It's hard to find the courage to get on my hands and knees and "get dirty" in the details of things I feel passionately about. Reading the story of Miss Ophelia made me sad over my attitude, at times, in not putting forth effort in the hard work of loving. Love is frequently the most needed thing necessary to bring about change. And sadly, I also must confess that I saw my sinful heart in the character of Legree. His hard heartedness was all too familiar. He failed to listen to the honest thoughts and valid excuses of those around him and he suffered miserably as a result. In his desire to be in charge, he lost all sense of decency and love for his fellow man and that was hard to read. It's easy to say that I wouldn't and couldn't be exactly like Legree (I truly would like to believe not!) but a hardened heart can take you to places where you never thought you'd end up. Slavery may be behind us - in some form or fashion - but there are still evils in this world which demand our attention and that would and should call us to action. We see injustices in society and in our daily lives - in our tight social circles. We really ought not to tolerate them but pray to the Lord to bring about conviction of sin wherever it is needed. We should pray to see the changing of hearts. I'm really glad to have read this book again. I felt and do feel convicted by it in so many ways. It's a powerful book because it is an emotional plea for truth and justice and is just as fitting a read for today's society as for readers in the 1850's. We all still have much to learn. "A hardened heart can take you to places where you never thought you'd end up." So true and a good warning. Thanks for sharing your insights from Uncle Tom's Cabin. I read it a long time ago, but I can remember some of what you write about. I enjoyed your thoughts - you nailed it that we can see ourselves in the flaws of the characters. I'll link your review on my post, along with the others that have come in. I just finished reading through the reviews that came in and it looks as if this is a book which was truly impacting to individuals for one reason or another. Makes for an excellent book club selection! Great thoughts, Carrie! You said it so well. This is a book that will stay with me for a long time. I'm not sure if I feel the same way about tics and traits. I was talking to someone the other night who kept saying, "You know," inbetween phrases and as filler for when he was trying to put things into words. I was getting so irritated I was tempted to make hash marks every time he said it and then show him. But I figured that would not be very kind and would not be received well. :-) I guess in a book it is ok if it is done well enough to show a characteristic of that person and yet not so overdone that it distracts. I like how you saw a bit of yourself in so many characters. I could definitely identify with Eliza and Mrs. Shelby. And THAT is why I get along with you so well, Carrie. I too find that sort of humor hilarious (one of the top reasons I love Dickens). In fact, last night after evening service I was telling Sarah (who was sick) how it had gone, and did impressions of everyone who was there. My dad has always been good at doing impressions and I guess we kids picked up on it. And for the record, it's not making FUN of them, it's enjoying other people's differences. I've never read this book. I've heard mixed reviews of it, but I really think I need to read it for myself and judge for myself. Thanks for your thoughts. They actually encouraged me to check it out. And yay!!! I'm happy you're willing to tackle Dickens. You have finally been converted... somewhat? Yes?